One of the most discussed phrases in Montessori is “sensitive periods“. In short, a sensitive period is a phase or window in a child’s development when they are most capable of and responsive to absorbing a certain skill. Before going into some these in more depth, it can help to know how to spot a sensitive period. Though there are general time frames for each of these periods, every child is a bit different in their development. You’ll know when your child is in a sensitive period because they are engaged, passionate, and energized by working on this specific activity or skill, and often return to it again and again. It can help to keep these sensitive periods in mind to better understand your toddler’s “tricky” behaviors too. From birth to two and a half years, children show a sensitive period for movement. 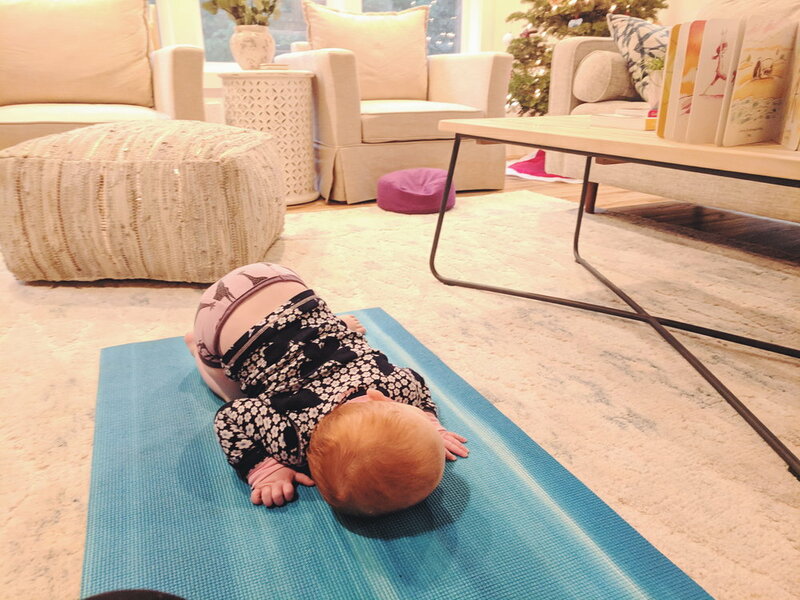 It is easy to see this in the great effort infants put in as they quickly transition from lying to rolling to sitting to crawling to pulling up. They use their hands in different ways to explore their environment and materials with more precision every day. Through the second year, toddlers continue this self-motivated movement but with more refinement, coordination, and control. Toddlers’ need to move and exert energy often seems limitless, and it practically is. D was a late crawler and walker, so her first year was all about fine motor. Now, as a toddler, she is going through a huge sensitive period for gross motor. 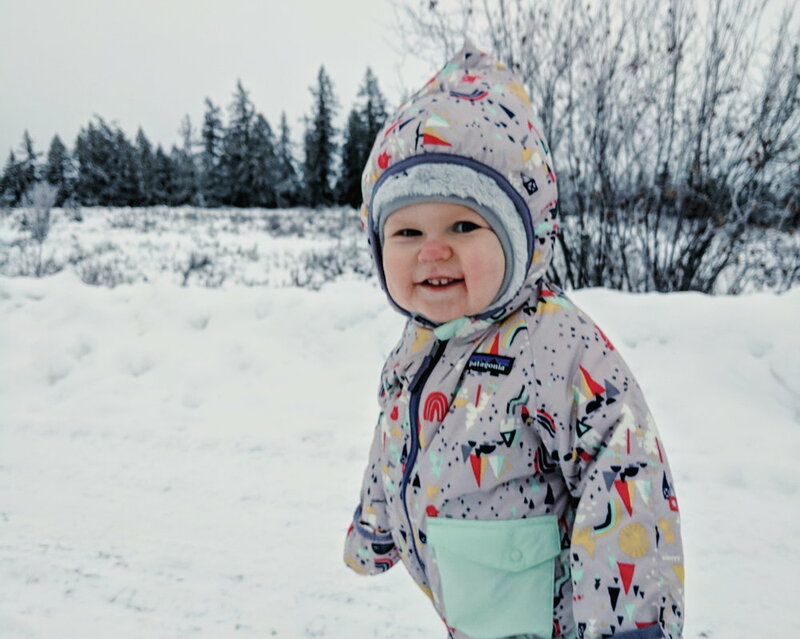 Every day includes a combination of a toddler-led walk, sliding at the playground, carrying heavy objects around the house, and climbing up and down the stairs on repeat. Giving her these opportunities to exercise her large movements gives her the ability to focus on her smaller work as well as eat and sleep better. Any parent of a toddler has probably noticed this one - they love tiny things. As soon as babies begin to move, they seem to notice every little speck on the floor, and need to pick it up. Toddlers find nothing more fascinating than collecting small rocks and picking every tiny flower. While parents often worry about choking hazards, reacting with panic or ripping small objects out of your toddlers’ hand will only lead to tantrums. We can give our toddlers supervised time to hold and inspect small objects to fulfill this need. Toddlers need this time to tune into the details of everything, and see those smallest features, changes, and qualities up close. They are not only learning about their fascinating environment, but also working on those much-needed fine motor skills and developing their concentration. Most of D’s favorite works include small objects right now, and at first with reminders (now without), she knows to keep them in her hand. Our rock collection is quite impressive these days. ;) Just the other day she found a tiny lock and key in our drawer, and rather than take it away, I observed her and watched with interest as she used her tiny hands to fit the lock inside and then sigh with huge satisfaction as she went on to repeat this a dozen more times. These little opportunities to work with small objects are huge for her development. This does not mean that toilet learning can’t happen after 2.5 years, but rather that the toddlers are quicker and more interested in the toilet before 2.5 years (usually before 2 years even). Children develop an awareness of their bodily functions around a year and can usually control their bladder and bowels pretty well by 18 months. Toddlers between one and two years also want to imitate everything we do, and this often includes the toilet, so it’s a great time to take advantage of that. If we start toileting during this sensitive period, we can avoid using bribes and rewards. Though it’s been a longer process, I am really glad we started toilet learning with D before 18 months, because now, at 21 months, she’s in underwear full-time (except for sleep). There are still some accidents and sure to be more regressions (especially once baby 2 arrives), but we’ve avoided any huge struggle over it. You can read more about this process in previous blog posts. Routine to their day is a big component of toddlers’ need for order. Montessori explains, “It is necessary for the child to have this order and stability in his environment because he is constructing himself out of the elements of the environment.” Toddlers crave routine and order in their environment because it provides a safe base from which they are explore everything else in the constantly changing (and big) world. External order helps toddlers and young children develop internal mental order. This is why Montessori environments have a more minimal look to them, and a specific place for everything. D is deep in this sensitive period right now. She is very particular about the placement of her things. She actually corrected me when I tried to put one of her materials back in a different spot or when I put her shoes in the “wrong” basket. I also find the days that we stick to her routine are much happier than the days we are in and out of the car or when she isn’t sure what’s coming next. Keeping up with our regular schedule most days, giving her a heads up when we can’t, and always having a consistent bedtime routine helps her tremendously with this need for order. Baby and Body Part Matching - Another mom blogger, Angela of Momtessori Life, created these lovely diverse body part cards that you can download for free online. Dakota loves pointing to and naming both her matching body part, and her little baby’s parts too. Baby Care Basket - As D is big into her baby dolls right now, this is another activity along that theme. I was inspired by fellow blogger Nicole’s post here. It is perfect for preparing for baby brother on the way! It also helps with her new interest in getting dressed. With the baby doll, I’ve included a newborn baby hat, socks, a small cloth, a brush, and a swaddle blanket in the basket. Mama and Baby Animal Matching - Now that D has mastered matching identical objects, she is having fun matching similar objects. Here she can match adult and baby farm animals. For these, I used various Schleich animals (love their detail), but you can use any type of animal figurines. You can read more about how we began language like this in my previous blog post. Palette of Pegs - This is one of my favorite materials to grow with D. We started with just the pegs, and have now added on the rings. There is something so satisfying about putting the pegs in the holes, and the rings on the pegs. In a few months, she’ll likely start matching colors, and eventually, creating patterns with this palette! Twist & Turn Blocks - This is a fun and colorful version of nuts and bolts. They can be used in various ways, but since Dakota is just getting the hang of it, I leave the blocks barely twisted on the bolt, so that she can master untwisting and separating. Once she masters that, I can make it more challenging by keeping the pieces separate for her to twist together. Valentine’s Activities - She is still really enjoying her Valentine’s day themed activities, which are pictured on the shelf. You can read more about those in my last blog post! Monti Kids - These next three materials are a few from our Monti Kids subscription box. Each of the six beautiful materials in this box provide D with the opportunity for intentional play and concentration. As a former teacher, I so appreciate the quality and authenticity of these Montessori materials. Each box comes with detailed video tutorials and step-by-step instructions, so you can be your own child's Montessori guide. For $30 off your first order, go to their website and use code REALLIFE at checkout. Object to Card matching - This language set includes 6 wooden figurines of community helpers, with wooden cards to match. The figurines are not an exact match (e.g. one firefighter has a yellow suit and the other is black), so it makes it an extra challenge for toddlers! Monti Kids provides detailed instructions on how to first present the figurines, and then add in the cards. Motor Planning Box - This is both a gross and fine motor effort work! D has to squeeze the large knit ball with both hands to get it to fit into the hole. For now, she still needs my help squeezing it in. Then she opens up the drawer, finds the ball, shuts the drawer (needs my reminding), and repeats. It takes planning, understanding sequences, and quite a bit of effort! Love the challenge here. Shapes on Pegs - D really enjoys this one on repeat. For now, she mostly puts the shapes on in a random order, but eventually she will be sorting by shape! I appreciate how the color and number are constants, so she can isolate shape as the variable. D is 16 months, and soaking up language like a sponge. She points to everything, wants a name for it, and often tries to say it back to us. We’ve used baby sign since 9 months, and that is still her primary way to communicate her needs. (In video below, she is signing “help please”). 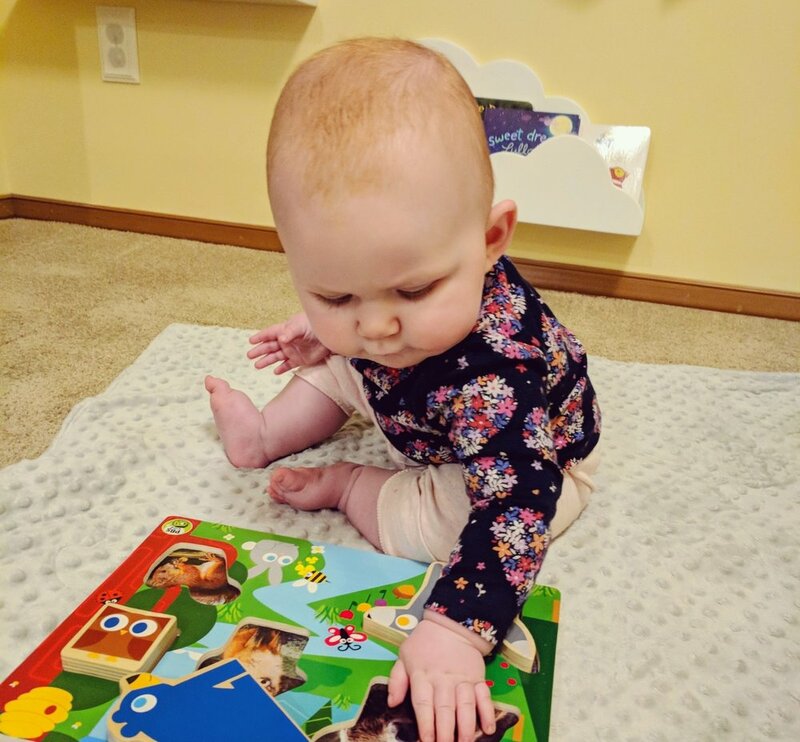 But she also has so many more words in her head than she can say out loud (and that I know the sign for), so this month has been all about activities to help her expand her receptive and expressive language. 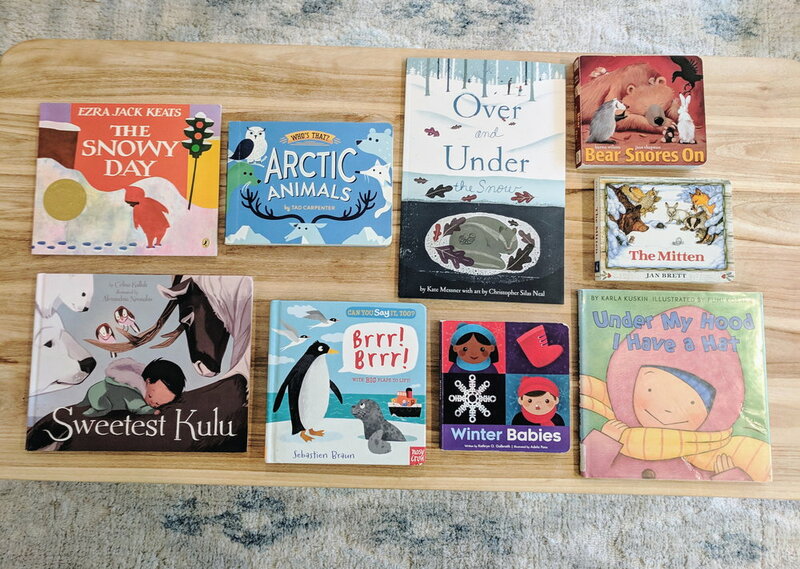 Montessori or not, some of the best ways to expand babies and toddlers’ vocabulary are books, songs, and simply talking through your day with them. While I try not to use too many words while Dakota is playing/concentrating on her own, I talk to her a lot throughout the day, whether it’s about what we are having for dinner, dressing after using the potty, or what we see while we’re out on a walk. She soaks it all in. There are board books for her throughout the house, and she loves to sit in her little chair and read to herself or have me read to her. Books are a favorite part of both our days. Her favorite language activity lately is her book of fingerplay songs. She opens the book and points to a song/rhyme and I do the fingerplay for it. It’s super sweet to see her start to mimic the movements on her own. Her other favorites are action songs that of course involve spinning and dancing. While books and stories are a very important component of language learning, Montessori also believed in starting with the concrete: “What the hand does the mind remembers”. Toddlers learn best through all their senses, especially their hands. When toddlers are first learning language, they get so much more out of holding an object than they do from a photo or picture of an object. 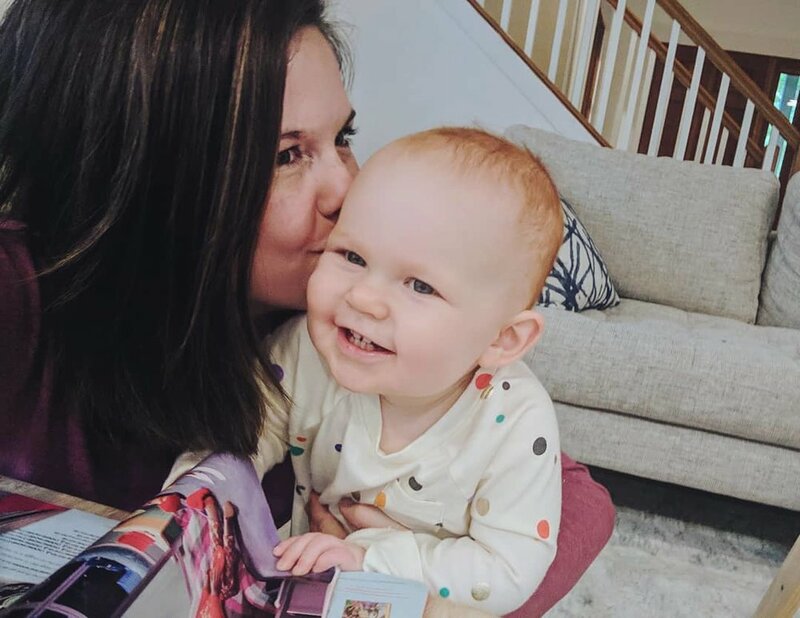 Since D was just a baby, and still today, I’ve given her lots of real objects to touch and explore, such as fruit and vegetables, kitchen utensils, household items and containers, and animal replicas. The more realistic, the better. D’s favorite items to explore now are any small replica objects (made by Toob), such as vehicles, animals, community helpers, and tools. I usually have at least one basket of objects (that fits in one category) on her shelf. To introduce this material, I start by taking one object out at a time and labeling it, for example, “delivery truck”. I repeat this with all the objects. Then I invite her to find each object to put back in the basket. If she doesn’t want to, that is fine! I also just let her explore the objects on her own, and provide labels if she asks for it. Below is an example of her exploring, and me labeling, real fruit. The next level up in Montessori language materials is object to object matching. Again, this involves tangible items for her to explore, but this time, pair together. When starting out, it’s easiest for toddlers to do this with identical sets of objects, rather than similar items. So I found a some inexpensive sets of animals at the local toy store to set up a “wild animal” matching activity. You can also use two sets of these Toob wild animals. When I first introduce the material, I take out one animal and label it, e.g. “elephant”. Then I find the other elephant in the basket, label it, and set it down right next to the first elephant. I repeat with the rest of the animal pairs in the basket (5-6 pairs max). Then I let her explore. Though she doesn’t line the animals up as I do yet, she has started to pick out two of the same animal from the basket, noticing the sameness. No matter how she plays with this material, she’s learning! Just this week I introduced object to picture matching, which is still quite a challenge for D, but a favorite of hers to explore and have me help with. Instead of matching the animal/fruit/vehicle to an identical object, she has to match it to a picture of that object. For toddlers, the more identical the picture is to the object the better, so I created my own laminated cards using photos I took of the objects at home. You can find pre-made language cards or photos online but they it’s harder to match the objects in size and details. In the examples below, I used the Schleich farm animals (large replicas), and Toob vehicles (small replicas). I’m sure I will be making many more sets of these in the near future! As with all labeling, when I present this, I do so slowly and with few words, so she focuses on what my hands are doing and the names of the objects. I lay out all the cards first, naming each one as I set it down. Then I pick up an object from the basket, e.g. fire engine, label it, and put the object over the matching card, covering the picture, then repeat the word. I repeat this sequence with each object. I find 4 matches to be the maximum for young toddlers. D enjoys covering up the pictures with the objects, even if she doesn’t always match perfectly! Again, it’s about the learning process rather than the product! With so much energy to work on both gross and fine motor, I’ve been having to rotate her shelves more often than I used to. This month I’ve been switching out toys about once a week. I always rotate only a few toys at a time, so as not to overwhelm her. Sometimes just moving a material from one shelf to another makes it new and interesting again! In total, I only have about 8 materials out at a time for her, not including books, her wagon, and practical life activities. Because we don’t have a designated playroom, I have placed her materials in various areas of the house, so she can get her gross motor practice in, moving from one station to another. She has two shelves on our main floor (one mostly books), across the room from each other. And in the dining/kitchen area, she has her sensory table and mini kitchen. This way she can be working wherever I’m working, though sometimes not! The kitchen is one of her favorite places to be, and you can find her latest practical life activities in my last blog post. But today, I’ll focus on her shelves in our living room. I tried to find a theme to link these toys together, but her interests are pretty varied right now! Which is probably for the best. :) From car trackers to animal noises to hammering, here are her favorite materials at 15 months. You can find previous posts like this on the home page. Hammer and Roll Tower - she can hammer with her hands or the hammer and watch (and hear) the balls roll down the tower. This is good gross motor for her too, because she has to go chase the balls to put them back on the tower! Rings on Dowel - this is a simple toy, but so great for fine motor and hand-eye coordination. Dakota has also been experimenting with putting other blocks on the dowel and realizing it only works with the rings! She gets a lot of satisfaction from doing and undoing this one. 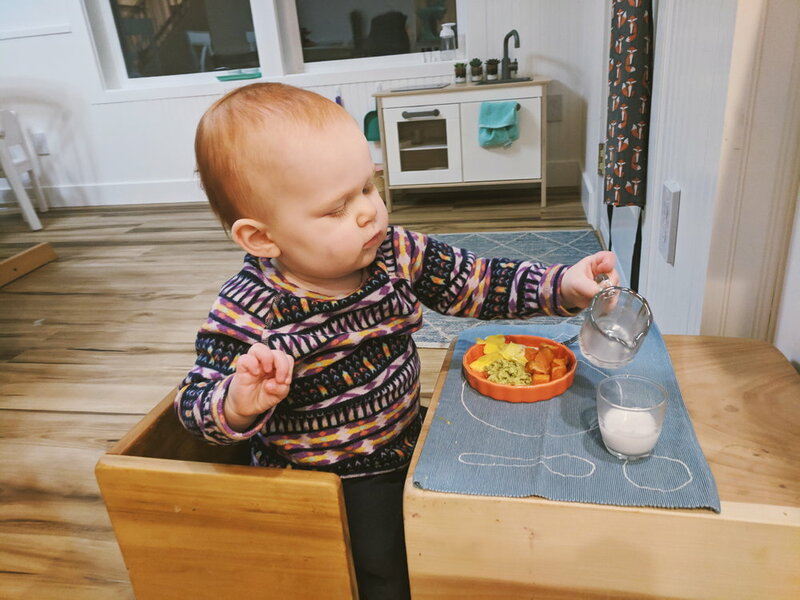 Imbucare Box with Slot - this is great multi-step activity because she has to put the chip in the slot, flip the lid, repeat, and then flip the lid the other way. It comes with just one big chip but I added a few other chips from the color sort bowls below. Drum Set - we brought this back out after many months because she has been so into her music class! She is much more coordinated now, and dances” along with her drum. Grimms Stacking Cups - nesting/stacking cups never get old. Dakota loves to nest the small cups in the bigger ones, and lately has been pretending she’s pouring water from one to the other. A simple and beautiful material! Color Sort Bowls - thought Dakota isn’t yet sorting by color, she loves to use these color chips in various ways. Lately her favorite thing to do on repeat is to pour the chips from one bowl to another. This entertains her for so long! Schleich Farm Animals - we have various sets of these animals, and they are so wonderfully realistic and sturdy. She loves making farm animal noises with these ones. Soon I am going to get another set of the same animals for her to match. Car Tracker - this is always a huge hit with toddlers of all ages. It takes some practice for them to get the wheels facing the right way, but then they get to watch the cars zoom down the track. It definitely fulfills their need for repetition! Shape Puzzle - we were actually supposed to get a circle sorter puzzle, but this one arrived in the mail instead! I decided to keep it because it’s a nice variation to the shape sorter, and nice sturdy knobbed pieces. She is still figuring this one out so it’ll be a good one to rotate in and out as she gets a bit older! Vehicle Puzzle - Dakota has shown a strong interest in vehicles and things that go this past month. She enjoys making the vehicle noises when she plays with this simple 3 knob puzzle. Dakota also has several toys in rotation (shape sorter, pull toy, stacking, and hammering) that came from Elfbox. This is an awesome toy subscription box where you can RENT the toys for a month and then send them back for new ones! If you really love one of the toys you can keep it for a discounted price. They also don’t charge at all for missing or broken pieces! If you’re interested check them out HERE and use code ELFFRIEND20 for $20 off your first box! Next up: our intro to art and sensory exploration! Dakota's first month of her second year has been all about in and out, up and down, open and close. So of course most of her toys are in line with this theme (see below). While last month she was constantly on the go, she is now back to work at her shelf. She has a few materials that she really loves to play with over and over, which has slowed down toy rotation, making my life a little easier. She also really enjoys combining her materials in different ways, especially when there are peg people to be moved from one box to another! In addition to new materials, I have also introduced trays for a few of her materials. Trays are a staple of a Montessori classroom, and now that we are nearing the toddler years, they are useful for home too. Toddlers LOVE order, and trays provide a sense of order for their materials. They can take the tray off the shelf, use the materials, then put it all back in one piece. It also allows for you to set up the activity "incomplete" for your toddler to complete it themselves. As a teacher, we noticed that if puzzles were set out completed, the toddlers didn't engage, whereas if the pieces were in a basket beside the wooden puzzle base on a tray, they would use it more often. I am hoping that my husband can build a new shelf soon that doesn't have cubes so that we can fit trays more easily! Here is a great resource for Montessori Trays if you are looking to purchase some for your Montessori environment. Pop-up Men - This is by far Dakota's favorite toy. Even when she's not pushing the men to pop out, or carefully putting them back in, she's toting these little guys around the house with her. I find them everywhere! Imbucare Box - We have a couple versions of this one, and they are great for learning sequences (drop, open, close, repeat). Object Permanence Baby Box - This little box comes with a large wooden ball but you can also get little peg people from this shop, both of which Dakota loves to put in and take out of this cute little box. Perfect size for her small hands. Hide & Seek Wooden Board - Another fun peek-a-boo game. I wish there were fewer doors than this, but it's still a fun one, and definitely one to grow with her in the toddler years as she begins matching. MontiKids Peg Board, Rings on Post, and Basic Shape Puzzles - These three (of six total) toys came from the Level 4 MontiKids subscription box. If you haven't heard of it yet, MontiKids is a Montessori quarterly subscription box that sends high quality Montessori toys perfectly suited to your child's development and age. In addition, each box comes with detailed video tutorials, lesson plans, and developmental info. This is a great opportunity for parents who want to provide a Montessori education for their baby or toddler at home! Use the code REALLIFE to receive $30 off your first order! How is my baby 1 year old?! The phrase "the days are long but the years are short" has never rung more true. What an amazing journey it's been! Our bond gets stronger each day. The way she says "mama", rests her head on my shoulder as I sing to her, blows me kisses, brings me books to read, and cautiously checks with me as she starts to climb the stairs just make my heart melt. I also love watching her interact with the rest of the world - not only is she a social butterfly who can charm the grumpiest of TSA agents - but she is observant, focused, and open to adventure. While Dakota continues to get sweeter, mom life never stops challenging me. Over the past few days, with cross-country travel, Dakota getting sick, sleep loss, and house renovations underway, life with baby has been exhausting. 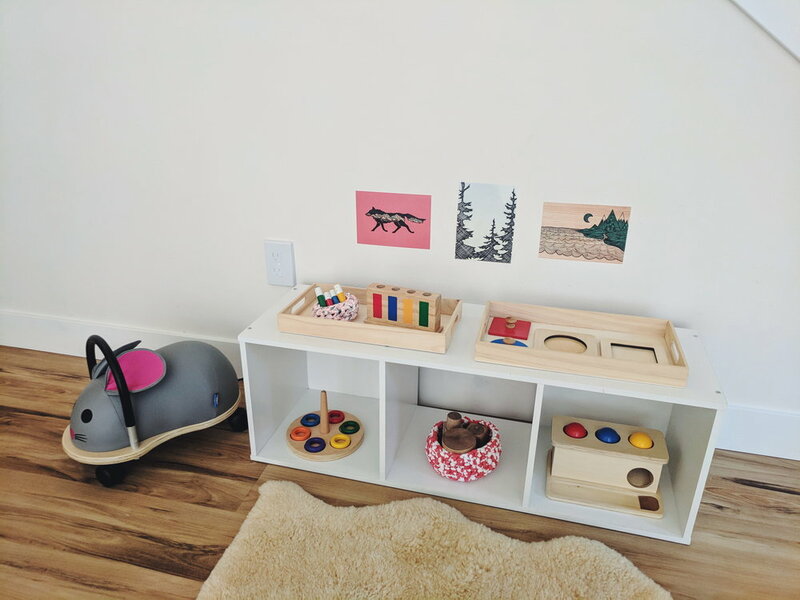 It's reminded me of why I started this blog "Montessori in real life", because real life isn't always Instagram perfect, and Montessori-at-home can become Montessori-ish. And that's okay. Sometimes it's pack-n-play or carrier over floor bed, stuffed animals over object permanence box, and squeeze pack over spoon. Sometimes it's crawling all over tired mama lying on a floor without furniture in the house. ;) It always helps to remind myself that phases are called phases because they don't last forever! And in the meantime, I enjoyed the extra snuggles that the past few weeks brought me. Besides her beloved books, the one consistent interest that Dakota has shown through all these "routine disruptions" is gross motor. (Available anywhere!) In the past few weeks, she is busier than ever. She's pulling up on just about any surface, climbing stairs, and trying to wedge herself in any small space she finds. While sometimes I wished she would focus more on the beautiful new ball tracker, it has been a good reminder to follow her interests and stop pushing mine. 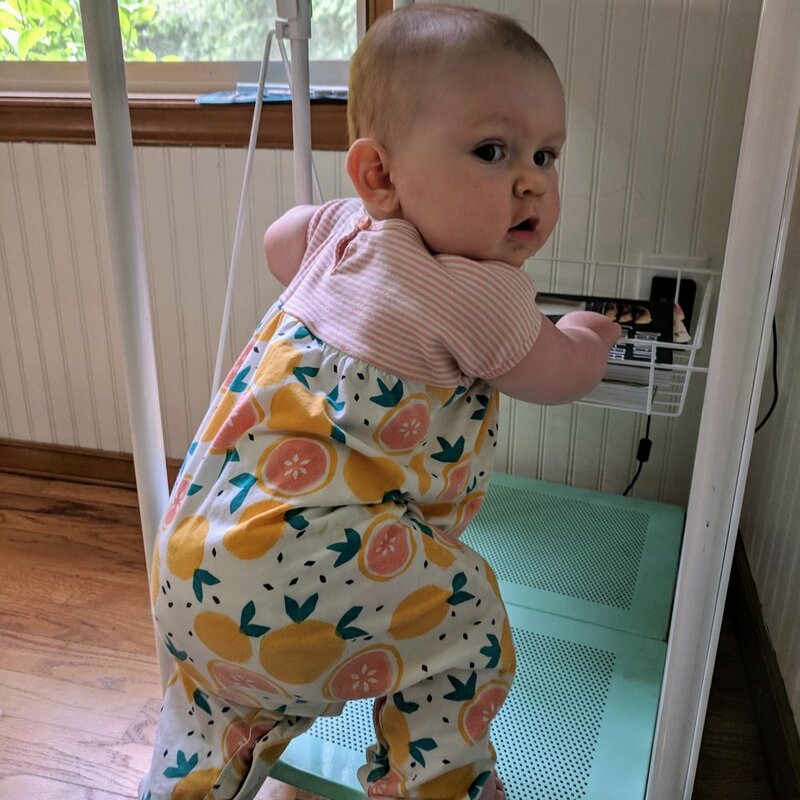 Setting up spaces for her involved simple things like moving cushions to the ground for her to climb over, filling a couple of drawers in the kitchen with things for her to unpack, and exploring the outdoors. I also purchased this tunnel she loves to crawl through and a pool to splash around in. 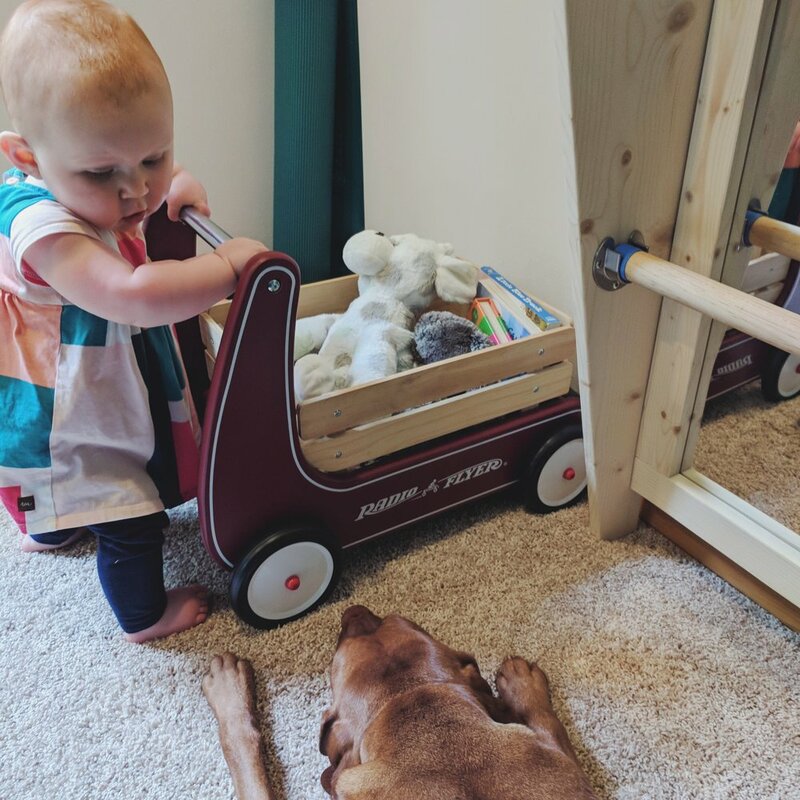 Dakota's grandma also gifted her this beautiful wagon which just began to "walk" through the house! This week when we returned back from our vacation, and despite still being sick, she surprised me by returning to her shelf to play with her wooden toys. What's more, even with weeks of not using these materials, she all of a sudden knew how to use them, just from my demonstrations a few weeks ago. For example, she put the pop-up men back in the holes, and opened the drawer to find her hidden ball in her imbucare box. It just amazes me how much babies' brains are processing and working through all the time, even when we can't see it happening. Sometimes I miss it, but when I do follow her cues and give her time and space to work through a new skill or phase, we are both happier for it. Lesson of this month: Practice patience and enjoy the present, because even the hard days are so sweet, and so short. Somehow another 2 months have gone by and Dakota is getting closer to 9 months old! The past couple of months have been the best, and Dakota the sweetest, and honestly I haven't thought a lot about blogging. Though in all honesty, another factor in my blog hiatus has been self doubt. Is this blog providing anything original or interesting? Do I come across as a mom snob? Nothing can prepare you for the insecurity you feel as a mom, and the constant worry that you are doing things worse or lesser than other moms! The last thing I want this blog to do is make other moms feel bad about choosing a different path for their child. Because as much as I believe in the Montessori method, I also believe every child needs something different, and every mom does too. 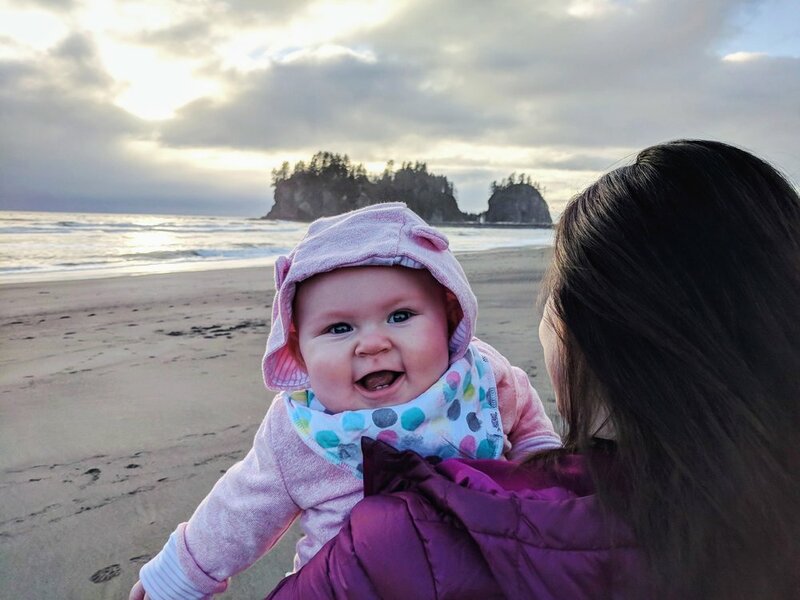 I started this blog as a way to journal my motherhood adventure with Dakota in our Montessori-ish way, and I realized this week that worrying about what other moms think shouldn't be what keeps me from continuing that! I hope other moms agree. :) As I always say, you do you. So I'm doing me. Back to the topic of the hour...Miss Dakota Mae. While no baby is happy all the time, Dakota comes pretty close lately. And I do know now how phases come and go, so I'm just enjoying this one while it lasts! I can't get enough of her many facial expressions, her hugs, "words", giggles, and how she "waves" at every person who smiles at her. Dakota just seems delighted with her world, meeting new people (and seeing the familiar ones! ), exploring her surroundings, but also really concentrating on her "work" at home. You can really see her start to see her understanding, and more impressively, her desire to understand, her little world. Because Dakota isn't crawling yet (lucky me, I know), she spends a lot of her day sitting or stretching out on her tummy playing with her toys. She is perfectly content doing this for up to an hour at a time, with or without me by her side. I try to make sure she has time each day to play uninterrupted, while I do my own work, to get her used to playing independently. This will be harder when she starts to crawl, but just this afternoon I finished the dishes and came back to find Dakota with her book open in her lap, "reading". My heart! 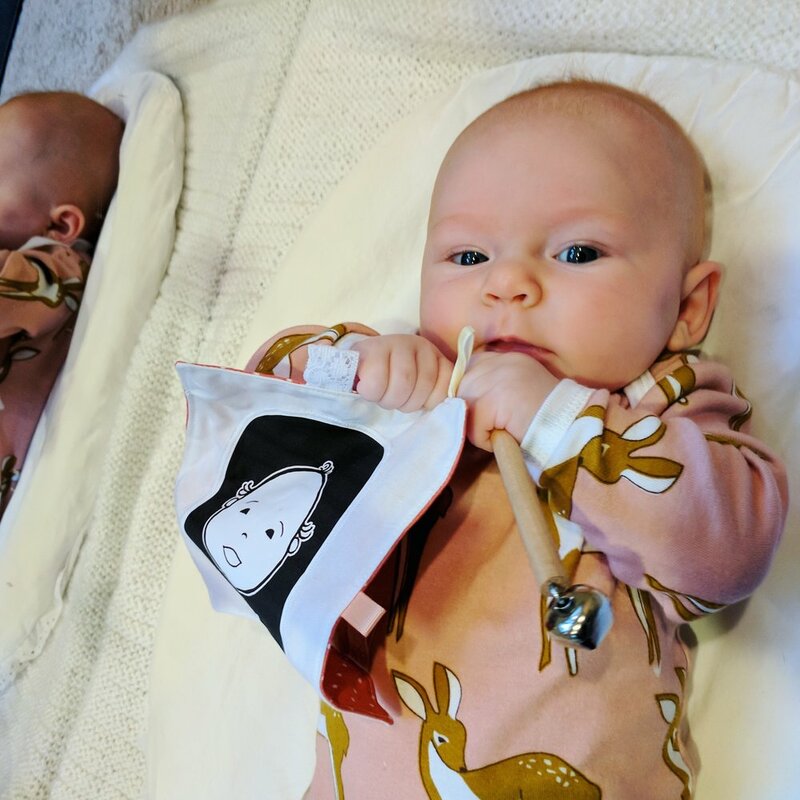 While she still very much enjoys her toys from previous blog posts (especially teethers with her top tooth about to poke through! ), I wanted to focus this blog post on her new favorites. Besides books and knob puzzles (both of which she LOVES), most of her favorite toys involve some kind of cause and effect. In the past month, she has really been figuring out that she can make things happen with her own two hands. When she shakes the eggs, she makes music; when she hits the bell, it rings; when she turns one gear, the other turns. Even if the toy doesn't make a sound, she bangs two toys together to create one. See below for some ideas! 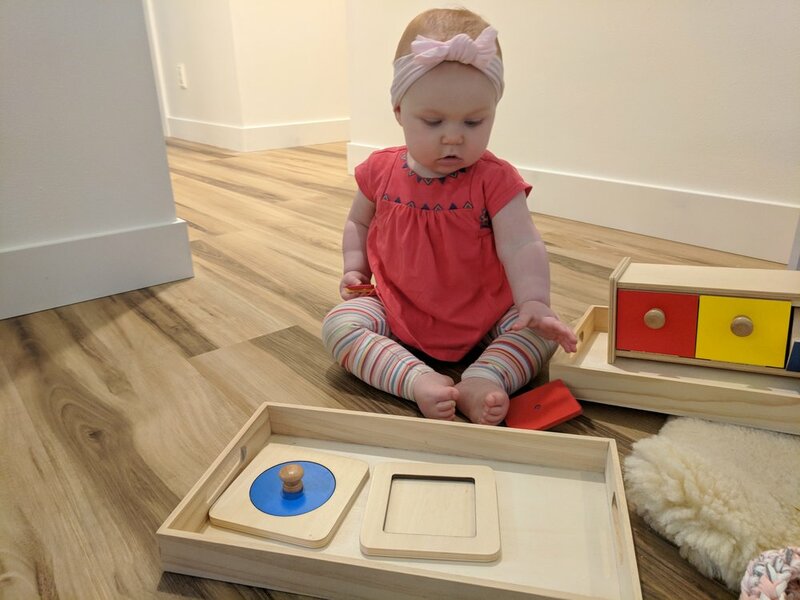 Montessori Object Permanence Box with Tray and Ball - we started this with me showing her, and now she takes the ball and attempts (occasionally successfully!) to put it back in the hole. She delights in seeing that ball rolling into the tray each time! Melissa & Doug Farm Animals Jumbo Knob Wooden Puzzle - this puzzle, along with others that have pictures under the pieces, are super fun and easy for her to pick up, and good pincer grasp practice! Egg Shaker Set - these entertain Dakota to no end. She loves shaking one in each hand and "entertaining" our dog! 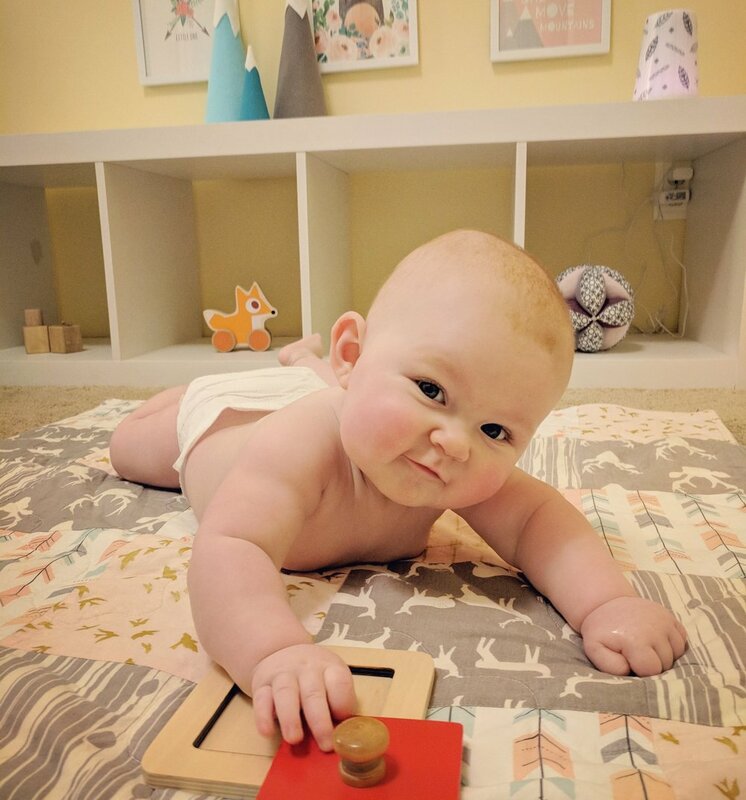 Single Shape Puzzles - the more traditional Montessori route to first puzzles, and likely the first that Dakota will get the pieces back into the inset, but for now just exploring. Sensory Board - Dakota's favorite toy! The noises and sensory experience of this board is amazing. Would be a fun one to make if you are handy like that. Play Cube Activity Center - My sister had this one, and it's the perfect size for babies to reach on their tummies or sitting. I love how she reaches over and around to get to the different parts of the cube. HABA Magica Clutching Toy - I kind of want this one as a stress ball for myself! A great one for babies to use two hands in coordination and teeth on too. 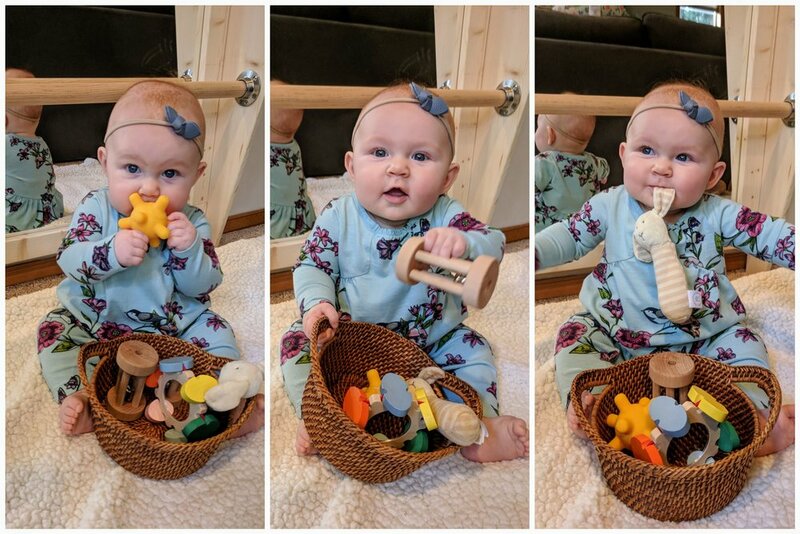 Hape Wooden Musical Instrument Set - Dakota is still trying to figure out how to really make noise with these, but she is enjoying trying! Multi-Color Rhythm Scarves - So many uses! Dakota loves pulling these out of a box, playing peek-a-boo with them, and just runnings her hands through them! Green Toys Stacker - a new favorite made from recycled milk jugs and oh-so-smooth and fun! The set-up of a child's environment is a key component of Montessori's philosophy. 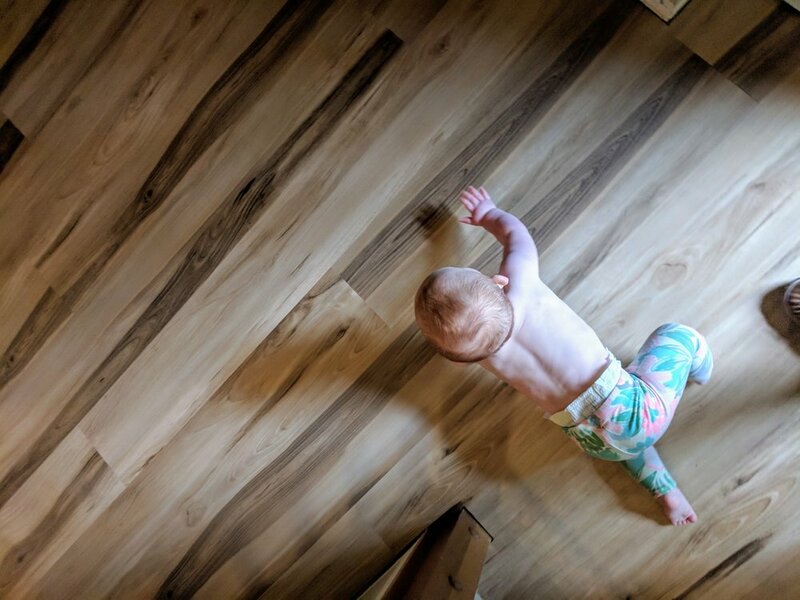 For an infant, a main feature of this environment is the movement area, where they can move freely in their natural position while absorbing their surroundings. Pictures and objects are placed nearby at the baby's eye level and be specifically designed to tap into their visual and cognitive abilities at each developmental stage. For the first couple months of a baby's life, this includes high contrast black and white mobiles, images, and a mirror for self discovery. The idea is that given time and space here, babies will work on concentration, visual tracking, gross motor skills, and develop an appreciation of quiet, alert time. Following this, I've set up various movement areas for Dakota around the house. My husband likes to tease me by calling them "cognitive development stations". 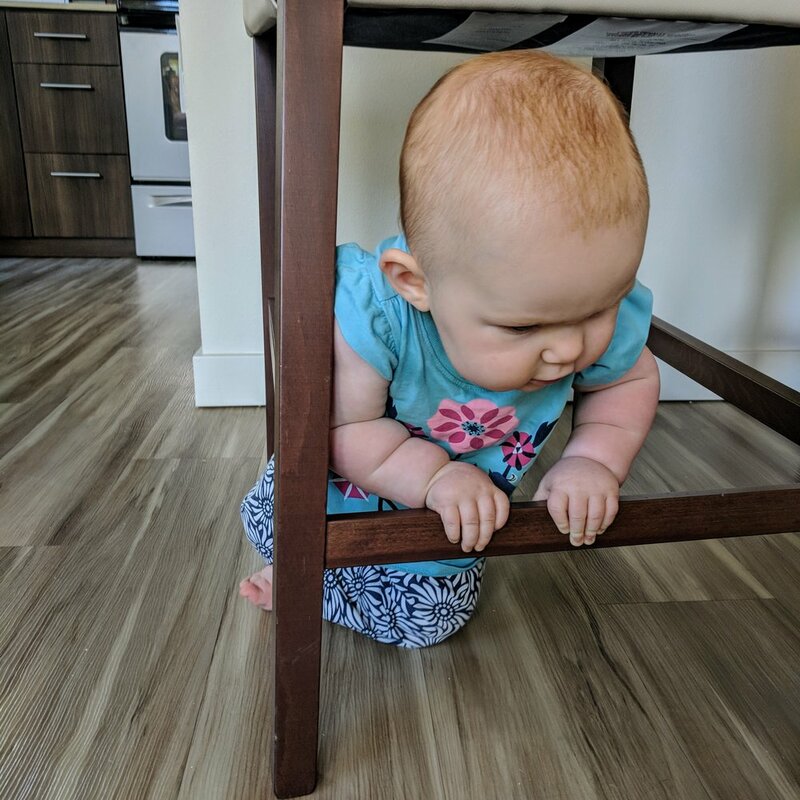 ;) In these areas, I usually lie her down on a soft blanket, rug, or the Montessori topponcino with plenty of wiggle room, and then provide some kind of visual stimuli appropriate to a newborn's sight and reach. This has been a big success for both me and Dakota. Several times a day, she lies on her own on the floor (up to 30 minutes at a time! ), content and focused on the black and white animals, herself in the floor mirror, or the munari mobile. I recently added in a bell on a ribbon that she enjoys kicking and swatting as she wiggles. Each set up is simple, but just interesting enough to capture her attention. It has been really fun to see her interest, concentration, and movement develop over the last month or so, as she "plays" on her own. It gives me a chance to really appreciate all those new baby sounds, expressions, and jerky movements. Seeing her happy in these movement areas gives me hope is that the time she spends in these movement areas now will give her an appreciation of independent play as she gets a bit older. It's nice to have that balance of social and independent time. Because it is equally fun to lie down next to her or cuddle with her, and these days, occasionally be rewarded with a smile! In these short spurts of Dakota's alert time, we are finding that balance of quiet time and mama time, both equally sweet.